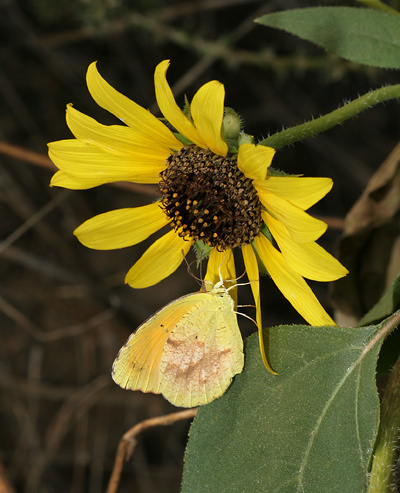 I photographed this Sleepy Orange (Abaeis nicippe or Eurema nicippe) butterfly in April of 2005, and its bright yellow ventral hindwings are characteristic of this butterfly's summer form. Summer form Sleepy Orange butterflies, those that emerge in the spring and summer, are noticeably more colorful than the winter form butterflies with their tan or brown ventral hindwings. I photographed this drabber winter form Sleepy Orange butterfly with tan ventral hindwings in October. 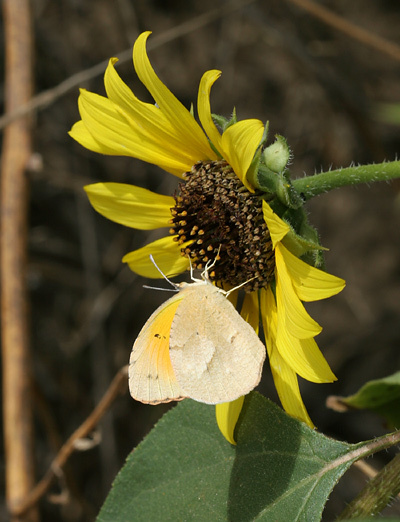 The winter forms do vary, and this other winter form Sleepy Orange has pale yellow ventral hindwings with bolder brown markings. 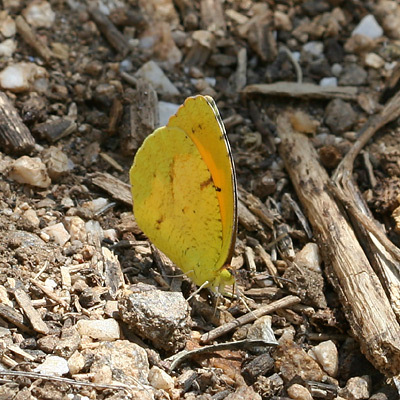 Male Sleepy Orange butterflies have orange dorsal wing surfaces broadly edged with black, and the females have duller orange dorsal wing surfaces edged in paler brownish black. Both sexes have a small, dark mark in the orange areas of the dorsal forewings. Unfortunately, all of the Sleepy Orange butterflies in my photographs have their wings closed, but they can also be identified by the markings on their ventral wing surfaces, visible when their wings are closed. Sleepy Orange butterflies have a brown band on the top edge of their ventral hindwings and an irregular black spot (or collection of spots) on their forewings adjacent to the band on the hindwings when the wings are closed. Also, the top edges of the forewings are faintly banded. Sleepy Orange caterpillars feed on Cassias (Senna species), which are quite common here in the Sonoran desert.